Luton Town endured a thoroughly miserable afternoon as they deservedly slumped to their biggest defeat of the season with a thumping reverse at Morecambe. The visitors had been reduced to 10 men before the half hour when captain Steve McNulty was shown two bookings in the space of 92 seconds, but that was no excuse for a performance that boss John Still felt was easily their worst to date this term. Hatters just had no answer to the physical edge held over them by an uncomplicated Shrimps side, who harried and completely dominated them in all areas for the entire 90 minutes, becoming the first team to score three against Town in the process. Still had made two changes as Charlie Walker missed out with a knock suffered in training, while Scott Griffiths dropped to the bench as Shaun Whalley and Jake Howells came in. Facing a strong wind in the first half, warning signs were there early on for Hatters as Jamie Devitt sent a looping header wide and Kevin Ellison was denied by a good block from the covering Luke Wilkinson. Devitt always looked a threat as he tried his luck with an angled drive, but Wilkinson was in the right place again to deflect behind. The hosts were deservedly ahead on 17 minutes when Mark Cullen gave away a needless free kick and Devitt’s delivery was met at the back post for Ellison to convert from close range. Hatters continued to look decidedly edgy as a number of passes were cut out by the hosts, to the audible annoyance of Still, with Wilkinson’s mislaid attempt leading to Paul Mullin glancing wide. Town’s task became even harder on 29 minutes as McNulty who had been booked for tripping Kevin Ellison after Wilkinson sold him sort, then needlessly fouled Mullin as he looked to turn near halfway and was shown a second yellow by Andy D’Urso, who once again, didn’t endear himself to the Town faithful. That left Luton with over an hour still to play with 10 men as they swapped to a 4-4-1 formation, leaving Cullen upfront on his own. Ryan Edwards quickly followed McNulty in the book, cynically and crudely stopping Jonathan Smith’s break forward as the temperature on the pitch at least started to rise. 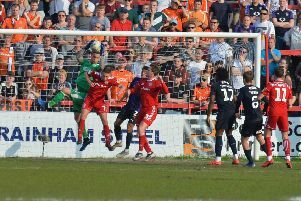 An awkward backpass from Nathan Doyle saw Mark Tyler slide in and clear at the feet of Ellison, while Mark Hughes’ header from the corner was blocked as Luton were hemmed in. The visitors then fell further behind when Shaun Beeley’s cross was met by Hughes and his header beat Tyler. It should have been 3-0 as Devitt’s shot was just out of the reach of a full stretch Ellison as Luton trudged off ready to face the wrath of an increasingly frustrated Still. After the break, the ineffective Drury was replaced by Alex Lacey, as Luton went to a 4-3-2, with the replacement at left back. Immediately it gave Hatters more pep going forward as Cullen broke away and forced Scott Davies into his first serious work, the keeper palming behind and he then tipped Whalley’s corner over the bar too. With some potency and urgency about their play, Luton looked like they could threaten a comeback as Whalley’s cross was headed over the top by Howells. However, Morecambe rode out Town’s spell and soon set about looking for a third of their own as sub Padraig Amond miskicked badly with Ellison’s follow up easy for Tyler. Ross Lafayette replaced Cullen with just over 20 to go and his flick on fell to Doyle who sent a low shot that Davies eventually gathered. Still the Shrimps looked the more likely of adding to their tally though, with Ellison foiled by a marvellous diving stop from Tyler, who made a routine stop from Devitt soon afterwards. Town’s horror show was completed with eight minutes remaining as a corner once again eluded their defence and an unmarked Amond swivelled to turn home from a yard. With the game up, sub Ricky Miller came closest to grabbing a consolation as his shot was deflected into the side-netting, but Luton left with what they deserved on the day, absolutely nothing. Shrimps: Scott Davies, Shaun Beeley, Jamie Devitt, Alex Kenyon, Mark Hughes (C), Ryan Edwards, Kevin Ellison, Paul Mullin (Padraig Amond 59), Stewart Drummond, Lawrence Wilson, Andy Parrish. Subs not used: Andreas Arestidou, Jack Redshaw, Ryan Williams, Alan Goodall, Aaron McGowan, Tom McReady. Hatters: Mark Tyler, Fraser Franks, Steve McNulty (C), Luke Wilkinson, Michael Harriman (Ricky Miller 73), Jonathan Smith, Nathan Doyle, Andy Drury (Alex Lacey 46), Jake Howells, Shaun Whalley, Mark Cullen (Ross Lafayette 68). Subs not used: Elliot Justham, Luke Rooney, Jim Stevenson, Scott Griffiths. Booked: McNulty 26, Edwards 30, Lafayette 86. Hatters MOM: Fraser Franks - defender was the most prominent in clearing Morecambe’s repeated attacks.